The lecture by HOTARU CORPORATION who uses UJF-706 and UJF-3042 was introduced in the Spetember 2012 issue of the OBGS Magazine. The artcle are introduced as it is below. The PDF of the original article is here. What is produced by a printng company's challenge to "Printng on materials other than paper" ? ― UV Print & Jig creation? On July 25th, a lecture was given at "The Inkjet Solution Fair" ( hold by MOTOYA CO., LTD.) taken place at the Osaka branch of Mimaki Enginnering CO., LTD. The title of the lecture was "Establishment of the Inkjet Division" and the speaker was Susumu Fukunaga, the general manager of HOTARU. It is common that the manufacturer introduces a print system or explains its usage. However, this time, the user who introduced the print system spoke his printing business and that filled the venue to its capacity. Addressing a large audience, Mr. Fukunaga started his talk. "The head told me that it is a time to try for the printing on the media other than paper, and that served as a trigger to introduce Mimaki's UV inkjet printer "UJF-706". Today, after two years, the sales have increased tenfold enabling the constant growth". Moreover,at present, HOTARU accepts orders of ten thousand smart phone cases from a major telecom company per month. What kind of a company HOTARU is, which made a leap forward? Time to try for the printing on materials other than paper. 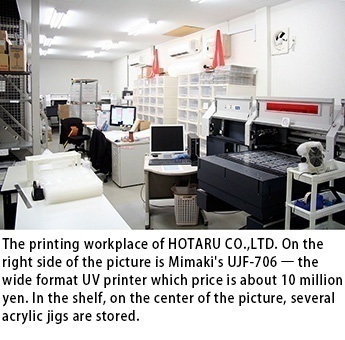 The parent company of HOTARU is HOTARU PRINTING CO.,LTD. founded in 1954 (Nishi-ku, Osaka). The company excels at printing such as instruction manuals or installation manuals of the major air-conditioner manufacturers. HOTARU PRINTING has a reputation for thier quality. They recieved the "Manual of the Year" which is given to the best manual in the "Japan Manual Contest 2011" conducted by Japan Technical Communicators Association. The reason why the company handled the UV printing was that their clients asked them to "Print directly on our carriage for 1000 units". At that time, they were trying for printing on materials other than paper, so they decided to introduce UV printers. Then, they moved the UV printers to thier affiliated company, HOTARU CORPORATION, and challenge to UV printng was started from the state of the total unexperienced. Mr. Fukunaga said " We did not know where we were at first. With the support of the manufacturer and wholesale dealer, we solved the problems one by one." Take printng on the carriage for example, which led to introduce the UV printing. The material, recycled polypropylene, was incompatible with UV ink ― the ink was not fixed. Then, taking advantage of a strong primer, we mastered the problem. The next problem was "Media jam". The heat from the head of the printer swelled the material, and striked the head. We took care of this problem by adjusting the light volume and jigs. The problems did not end there. UJF-706 is the printer that can print on the thick materials. When there is a gap between the head and the material, the ink mist is caused, which attaches to unexpected part. "The ink mist prevented us from the fine finish. In order to deal with this problem, we consulted Mimaki. They made some adjustments and incorporated a device which removes static electricity at last. Then, we became comfortable with the UV printing." Could you make jigs for the UV printing. Overcoming some troubles with UV printing, HOTARU do their job steadily and enhanced their skills rapidly. 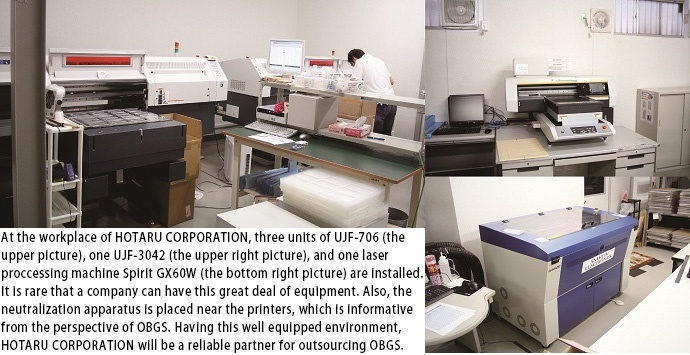 Now they have three units of "UJF-706 (large format)", one "UJF-3042 (small format)", and one laser proccessing mahcine "Spirit GX60W". The laser proccessing machine were introduced to make jigs for UV printing. When printing on the several shape materials, such as the boll point pen or the golf ball, jigs are neccesary to fix the materials. Accumulated experiences of UV printng and creating jigs, they want customer to use them as a subcontractor of OBGS. Mr. Fukunaga says "As well as UV printing, we can support jig creation which company has UV printer themselves". In general, outsourcing jig creation costs a great deal. However, if it is simple, HOTARU CORPORATION is thinking of offering jig creation at low cost like several thousand yen. Furthermore, stripping test such as Cross Cut Testing and Pensil Scratch Testing are available if needed, so customers can trust them to offer a job. HOTARU CORPORATION will be a reassuring support of OBGS, such as the small amount UV priting and jig creation for printing on the thick material. The official web site of HOTARU CORPORATION CO., LTD. The official web site of GENDAI PUBLISHING CO., LTD.